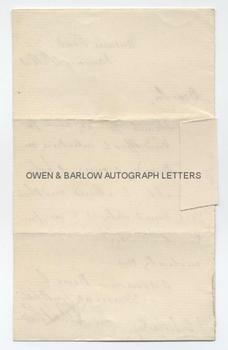 SIR GEORGE GILBERT SCOTT Autograph Letter Signed. ALS. 1p. Avenue Road. January 4th 1850. To J.J. Scales Soper [?]. "I thank you very much for your kind offer to introduce me on Monday evening. I hope to be able to attend and shall feel much obliged to you for your kind assistance in initiating me." 8vo. Approx 7.5 x 4.5 inches. Lacking integral blank leaf and with a piece of album leaf affixed to left edge of blank verso. All else fine. Sir George Gilbert Scott was the best known architect of the gothic revival in 19th century Britain. He was one of the most prolific of Victorian architects and was responsible for more than 800 buildings. Amongst the best known of these are the Midland Grand Hotel St Pancras Station, the Albert Memorial, the Foreign and Colonial Office and Glasgow University. 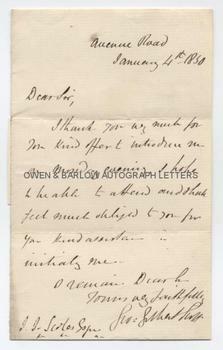 At the date of this letter, George Gilbert Scott was still a relatively young man of 39. A few months earlier he had been appointed Architect and Surveyor of the Fabric to Westminster Abbey.